I left Angelus Oaks with Greg Knight. 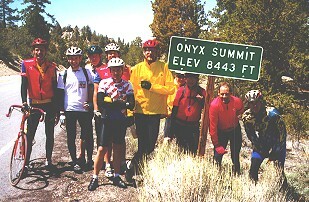 It's 19 miles to Onyx Summit. Most of it is up and up. Greg's a strong guy and it wasn't long before I had to say "Adios" as my Heart Rate Monitor was climbing above 175. Greg was smoking on all cylinders. 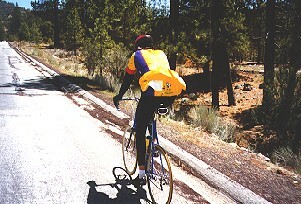 Greg LeMond raced hundreds of days. Yet, of all of those races, he says his very best day was on the Luz Ardiden stage in the 1990 Tour de France. 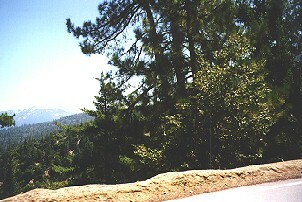 the climb up to Luz Ardiden." 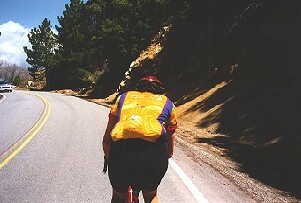 Greg won the Tour de France that day … by climbing at beyond full throttle … and pulling Miguel Indurain the entire way up and up the mountain. At the end, the baton is passed from LeMond to Indurain who goes forward for the stage win. LeMond won the whole Tour de France in 1990, as he had done in 1989. Of course, Indurain learned much in 1990, picked up the baton, and went on to win the Tour de France in 1991, 1992, 1993, 1994, and again in 1995. The Luz Ardiden stage video is so inspirational to me. I watch it before I go for a mountain climb ride. I replay it in my mind often. I would highly recommend checking out this stage in the 1990 Tour de France video. Later, "The New Ken" caught up with me. It was great to ride with Ken -- smooth and steady. We talked about the plans for Web Cam for these bike rides and figure we should be able to have live camera feeds in a couple of years. This would be totally cool!! Ken was totally recovered and road well right up to Onyx!! My hat is off to Ken for picking himself up by the BootStraps (a computer joke), recovering from the Grim Reaper, and going for Onyx -- it was an awesome thing to see!! In fact, he rode right away from me as he started to really smell the barn. At Barton Flats, I reached back for another GU: panic set in when I realized that I didn't have anymore in my back pocket. "Scotty, can you divert some power from the Anti-Matter engines?" "Captain, I'll do my best but we're looking at bad news down here"
I decided to burn straight GU's on the ride today. I was glad to find 3 more of them buried at the bottom of my Huge Blackburn Seatpack. That was a close call: when you bank everything on GU's, you can easily see the Grim Reaper when you run out of them! "No Whining" -- that's what the button on my Seat Pack says. 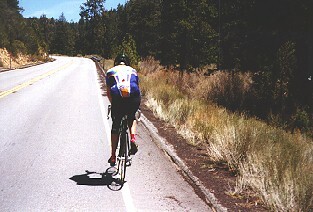 At about 3 miles from Onyx summit, I saw Victor Matloff coming down. Wow: HE WAS PUMPED!! 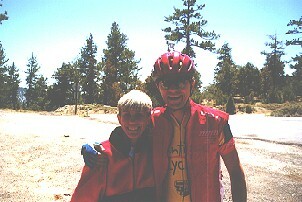 I came up to Tom Sparks in his beautiful 1999 Wildflower Century Jersey. It was the highlight of the day to ride side by side with Tom and fly into Onyx Summit together -- front wheels in perfect alignment. It sent chills up my spine as I was riding it. It sends chills up my spine now as I remember. It was a great moment in time. 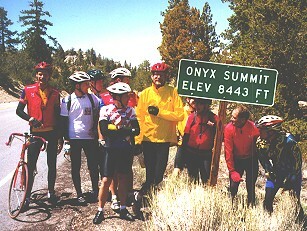 I've ridden a lot of rides over the past 12 years but to arrive at the famous Onyx Summit at 8,443 Feet together was a really cool feeling. 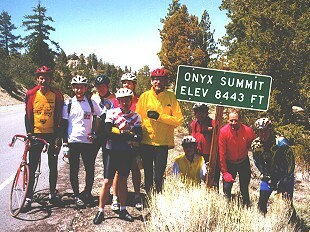 Barb Hill closed down Rest Stop 2 at the Ranger Station and then went up to support us at Rest Stop 4 at Onyx. The feeling was way beyond words. Greg Knight wrote: "I've gotta tell ya...that was no doubt one of the best experiences on a bike I've had! ... What to me made this thing epic was the sense of camaraderie of those of us that did the 4 pass ... what do the 15 or so that go to Onyx do? En masse, they wait for all the rest of whoever to reach the summit! Most of these people don't even know everybody else's name. To hell with the times, it was the experience that genuinely counted. I've never experienced this and don't doubt to ever see it again! I still shake my head in amazement and gratitude that I was a part of it. That picture at Onyx will mean something very special!" Just as we pulled in, Pete Smith was heading out of the Onyx Rest Stop. Pete had an outstanding day and was a major contributor to our great paceline flying out San Timeteo. Victor later reported that Pete and Robert came up to Onyx pretty much together … with Pete making it to the top about one minute before Robert. All this after nearly 11,000 Feet of Climbing -- it's absolutely amazing!! The celebration at Onyx was really fun this year. Dave Evans was there with a big smile on his face. Dave is 61 years old and loves to climb mountains!! Robert was there and congratulated us all for a hard climb. Lots of photos were taken and the endorphins were really flying. It was party time with some outstanding Bananas, Cookies, and Gatorade Cocktails. 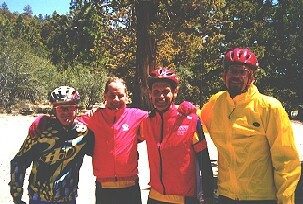 Congratulations to the 4 Pass Finishers below: Climbing 10,070 Feet in 65 Miles is awesome!! Only 9 minutes separated the Top 3 Men after all that climbing! !